Headed out for dinner? Here are some tips that can help you stay on track with you fitness lifestyle goals! One tip I use when dining out is to order half my meal. Just ask the server to box up half for you before you get it. You’ll be surprised how much food half is, and you trick your brain because when you clean your plate you won’t feel terrible afterwards! Another tip I use is to always get the side of vegetables! Fries have zero nutritional value, just don’t get them -you’ll be OK I promise! You know you can order those veggies dry? They won’t be raw but they won’t use a half a stick of butter when sauteing them. 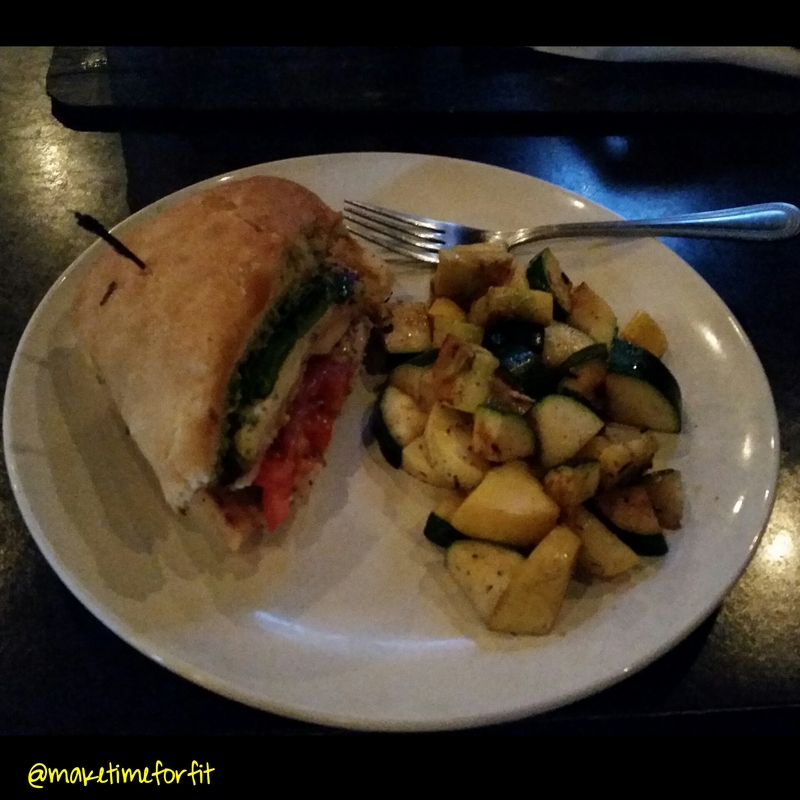 I got a chicken caprese sandwich with a side of zucchini and squash. That doesn’t look like half a meal does it? Portion sizes are outrageously large in restaurants and often times our eyes are way bigger than our stomach! Go to the restaurant with the mindset to order half and you’ll get to enjoy your meal without the guilt! PLUS you get leftovers! Need a workout program? Start today! Email maketimeforfit@gmail.com for a free consultation to get your personalized workout program! AB/CORE SIX-WEEK PROGRAM AVAILABLE NOW! Summer is around the corner and I’m here to help! 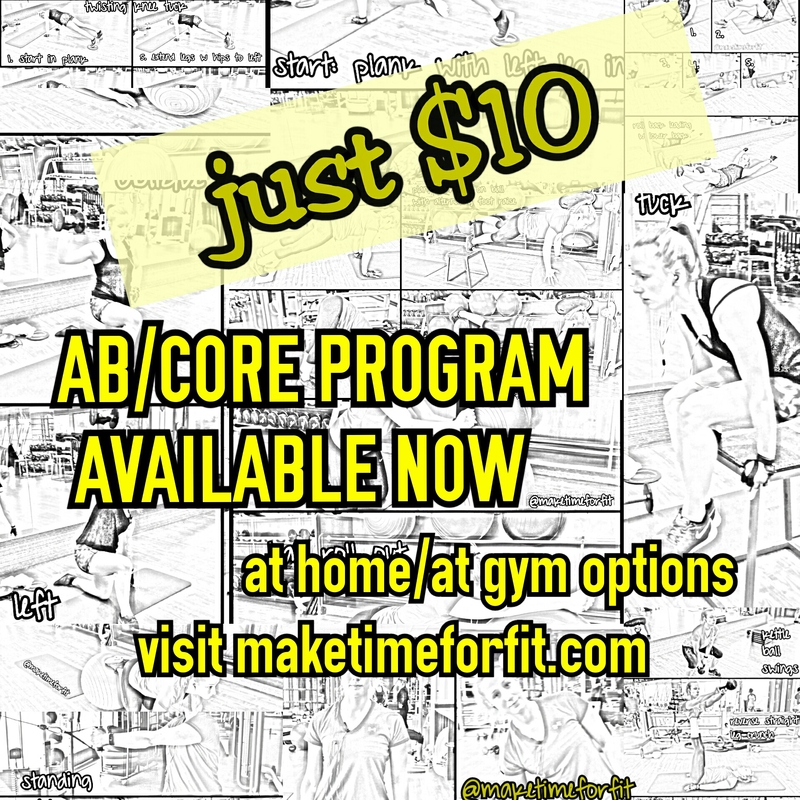 I’m offering a six-week ab/core program – JUST $10!